The East End of London has strong historic connections with America. The first colonists to settle the New World came from the East End beginning their voyage from Blackwall, the Mother of Thomas Jefferson, one of America's greatest Presidents, was raised in Shadwell, one of the poorest areas of East London, John Quincy Adams, 6th President of America, his greatest grandparents emigrated from the East End of London to Massachusetts in 1633, the First Liberty Bell was cast at the Whitechapel Bell Foundry which still exists to this day. Thomas Jefferson's Grandfather was Isham Randolph, Virginia's Colonist Agent in London, on one of his many trips over here, he met with Jane Rogers, they fell in love and were married at Whitechapel Parish on the 25th of July 1717, they moved to his house in 'Shakespeares Walk', Shadwell, where their first child Jane Randolph was born 9th. 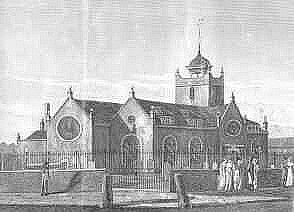 February 1721, she was baptised at St Paul's Church, Shadwell, it later became known as the 'Sea Captain's Church' 75 are buried there, including Captain James Cook's son who received his baptism there. In 1735, Jane would have been 14 when the family moved to Virginia, they settled on Isham's plantation which they had aptly named 'Shadwell', soon after their arrival, Jane Randolph was introduced to Peter Jefferson, whom she married in 1739, their third of ten children was Thomas Jefferson, born in 1743 from the humble beginnings of Shadwell, he rose to become one of America's greatest Presidents and is much lauded to this day. (see below). By the 17th Century, the district of Stepney had became a centre of industry for marine roperies, tan yards, breweries, wharves, smiths and numerous taverns, by 1674 most of its 8000 inhabitants were mariners, watermen or lightermen. In 1699, Thomas Neale, famous for constructing St Paul's Chapel in 1656, petitioned Parliament for a new Parish to be created, soon after, Shadwell was established as the first Parish since Whitechapel Parish in 1338, and became a Parish of St. Dunstans Stepney. 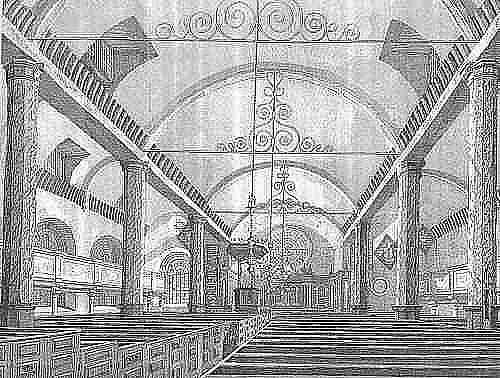 The small Church interior of St. Paul's in the Highway (left) has changed little since Thomas Jefferson visited there, but the exterior of the Church was extensively re-styled 1817-1821 and a Baroque tower added, compare the pictures of the old Church above with the modern Church today (right). 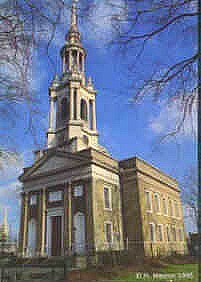 St. Pauls Church is accessed from 'The Highway' E.1 It is a shortwalk from Shadwell Underground Station . The many Seamen who met there smoked clay pipes, many were uncovered during excavations in the 1980s. Today the Church crypt houses an infant School and its rear a modern conversion of Luxury dwellings, approached via a gate and stairs, which were created during the London's Docklands 'LDDC' development of Shadwell Basin and Wapping which were part of the old 1805 London Docks. Despite a remarkable history, Parts of Shadwell, although stll suffering from neglect, thankfully the poverty of the past has gone and the area is now receiving some sizeable investment, many visable signs of deprivation are being eradicated with new developments, where the Local Authority has been slow in seizing the opportunity to invest in old Council stock, an eyesore that still needs positive attention. The Tower of London is just a few minutes walk from the proud history of Shadwell, a Genealogy centre would be an assett for this area as many visitors to the Tower might wish to trace ancestors and family roots. 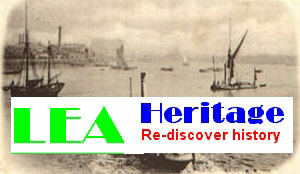 To learn more Visit Shadwell Basin.